I had to work for Halloween, and it is my favorite holiday. One of my favorite shows is the walking dead, so I thought hey, why not, I’ll be a zombie! I went to work that day in just some ripped up clothes but I did not have my make up done yet. I went to the local convenient store and purchased some liquid latex, and bright red lipstick. From 8:30am-12pm I sat at my desk, answering phones and preparing my zombie look. 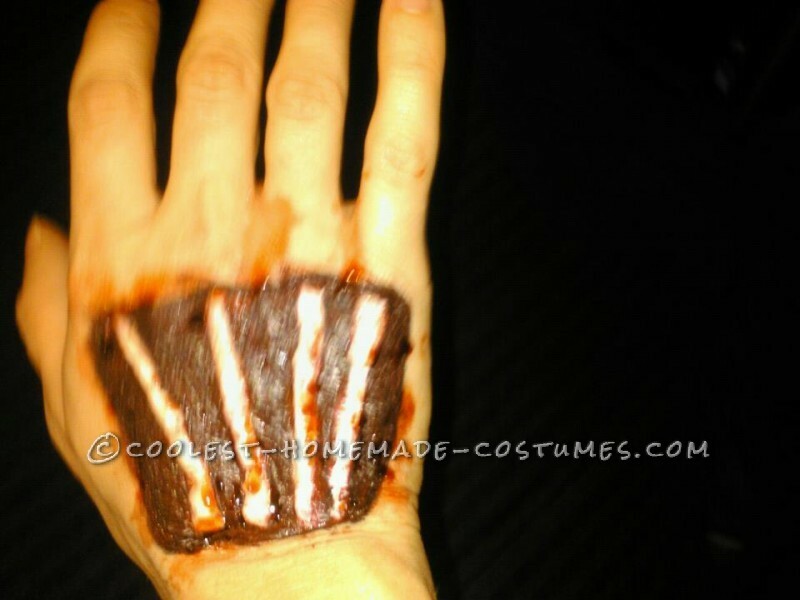 I used the liquid latex and outlined where I wanted my wounds to be, once outlined I put rippings of Kleenex over the glue. 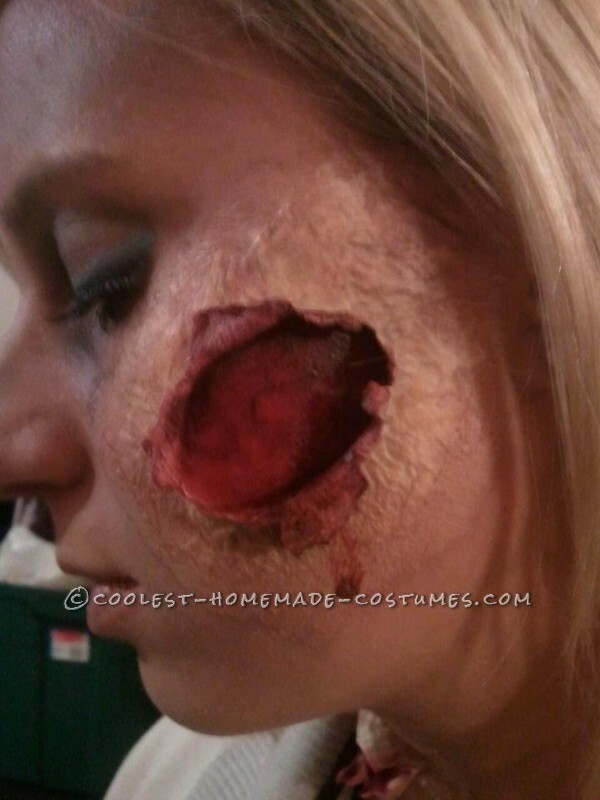 I did this multiple times, I believe 7 layers all together and then one last layer on liquid latex over it. While that was drying I put on my foundation, and used some brown and grey eye shadows to bring out my cheek bones and darken my eyes. I also used a blush brush and put red lipstick on it, then brushed it under my nose and the top of my head to make it look like bruising and wounds, added some purple shadow to make more realistic. I also added red eyeliner to my waterline under my eyes to make my eyes look sore. Then it was back to my wounds, after ripping back the latex and tissues to the size I wanted, I drew out my teeth with red lipstick and around them with the lipstick as well. Now this was getting very difficult to do with no help at all, also while answering calls and providing excellent customer service. 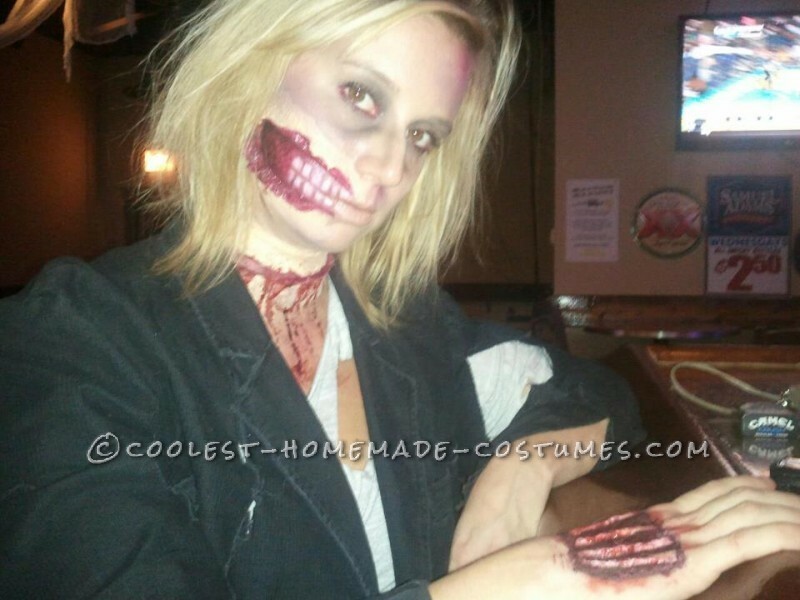 After I finished the inside of the wound, I used a lip brush to color in the part of the “flesh” I ripped away, added some black eyeliner to the corners of the inside wound to add depth, and then colored in the teeth. I then added some purple shadows with a blush brush around my wound to look like more bruising. After that was finished, I repeated all steps for my slashed neck. Once my costume was complete, it was a total transformation, my co-workers were terrified. I even had some people see me and turn around and speed walk in the opposite direction. 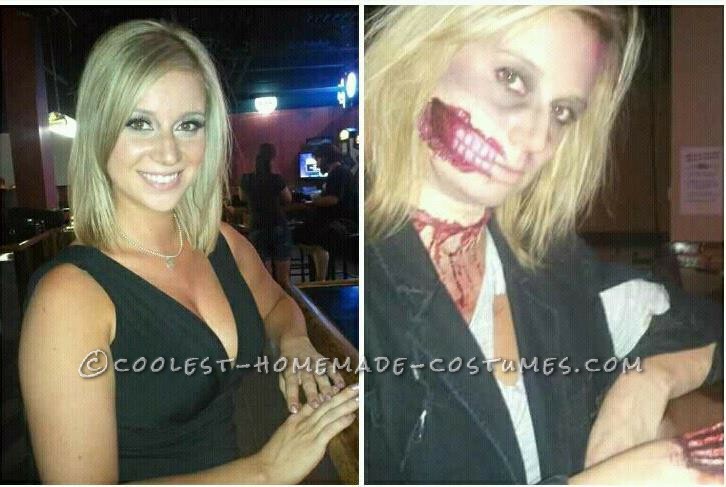 Halloween night my costume was a complete hit everyone was complimenting me. This has been the BEST homemade contest I have ever made! Easy Maternity Snoopy Costume for Under 8 Dollars!